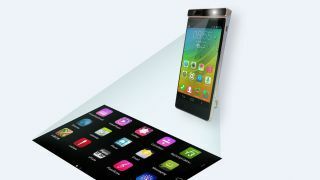 Lenovo has thrown a lot of news at us during its TechWorld Conference - including news of a smartwatch with a second screen – but one of the most interesting elements is the idea of a smartphone with a projector in it. Rather than limiting users' experiences on their smartphones to just the screen, the Smart Cast can project a large virtual touch screen onto a table or any surface. It can do this thanks to being outfitted with a built-in laser projector, infrared motion detector and high-performance algorithms. Lenovo promises it's a first ever technology combination that will open up a whole new world of interaction, such as the ability to type on a virtual keyboard. There are also plans to make the Smart Cast concept work with productivity apps including the calculator, drawing, note-taking and even editing in Microsoft PowerPoint. Additionally, the Smart Cast will be able to act as just a projector to turn a wall into a virtual movie theatre, presentation screen or scratch at the air to play Fruit Ninja with hand gestures. In a real-time stage demo, the Smart Cast phone was used to project virtual sheet music as pianist played on the stage. Lenovo also posited that Smart Cast could change the way we video chat with the ability to project presentations and other content while seeing a different picture on the main screen at the same time. For a full look at the rest of Lenovo's announcements check out our round-up here.